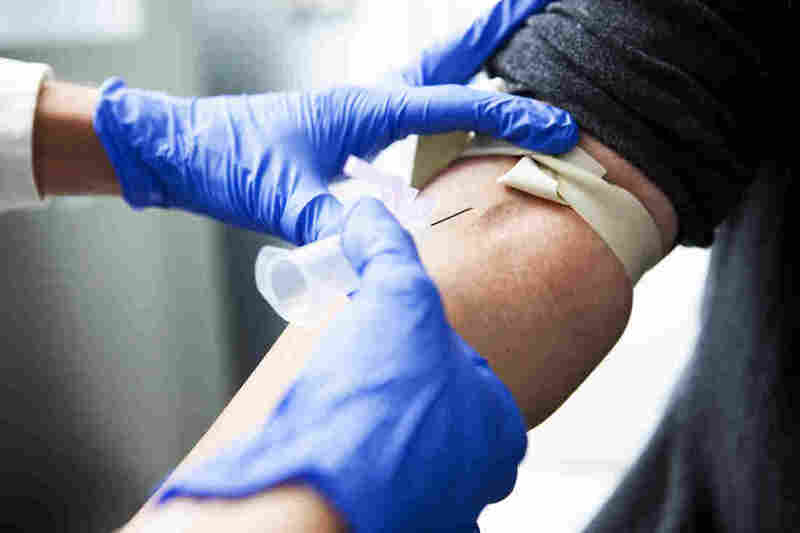 Common Lead Test Can Give False Results, FDA Warns : Shots - Health News Common blood tests for lead can give falsely-low results in certain cases, according to a new warning from the Food and Drug Administration. The FDA says blood lead tests manufactured by Magellan Diagnostics can give falsely-low results if they are used with blood drawn from a vein, as opposed to a finger or heel prick. The tests, manufactured by Magellan Diagnostics, are commonly used in doctors' offices and clinics, and on its website the company calls itself "the most trusted name in lead testing." But the FDA now says that its tests can give inaccurate results when used to test blood drawn from a vein. The majority of lead tests are not conducted with that kind of blood sample, but rather blood from a heel or finger prick, says Dr. Jeffrey Shuren, director of the FDA's Center for Devices and Radiological Health. "We have no evidence that Magellan's tests, when used with blood obtained from a finger or heel stick, are impacted," says Shuren. "We believe most people will not be affected by this issue." For example, in 2016, the Centers for Disease Control and Prevention recommended that all children under the age 6 years in Flint, Mich., get re-tested as part of the response to the crisis there. Patrick Breysse, director of the CDC's National Center for Environmental health, says they have a lot of information about that testing, and have determined that "less than one percent, perhaps, might be at risk for being under-estimated because they were a venous draw that were tested on the Magellan system." Officials are recommending retesting for certain children, pregnant women and nursing mothers who did get tested using blood from a vein. And the FDA says it's aggressively investigating why these tests can give inaccurate results. Officials say the company first became aware of a potential problem through complaints received in the fall of 2014, and developed a mitigation plan, which was to basically just delay processing of the sample for 24 hours. "And that completely resolved the problem. They communicated with their customers, their customers acknowledged receipt, and that was it," says Shuren. But earlier this year, when FDA officials became aware of the problem, Shuren says the agency believed that the company had underestimated the risk to the public, and that the data supporting the mitigation plan wasn't sufficient. Between the beginning of 2014 to today, officials say, an estimated 8 million blood lead tests have been run using the Magellan systems, and the majority of those were for capillary blood from finger or heel sticks. "From a coverage perspective, particularly for those kids on Medicaid, we would expect that the Medicaid programs in those states would be covering and paying for the retesting," says Timothy Hill, the Acting Director for the Center for Medicaid and CHIP Services, which is part of the Centers for Medicare and Medicaid Services. "For those who are covered privately, we would encourage folks to consult with their health plan." Asked why taxpayers or insurance companies should have to pay for retesting, Hill said the first priority is to get kids retested if they need retesting, and officials do not want reimbursement to hold that up. "It's my understanding that the, sort of, conversations with Magellan are ongoing," says Hill. "Speaking as to whether or not Magellan has liability or not is not something I can speak to." In response to NPR's inquiries, a spokesperson with Magellan pointed to a letter to its customers that the company published this morning.